Many years ago, just after I left school, I worked as a Production Assistant in a publishing company in Muswell Hill in north London, down the road from where I lived. The Production Director was quite eccentric – my interview for said post took place at 6pm in the evening, lasted two hours and included him inviting me to sing a few bars of a Mahler symphony. He wrote a cookery column in the Saturday Telegraph magazine. The column would normally consist of two paragraphs of him writing in amusing vein – reminiscing, say, about having been taken to tea by his grandmother at Fortnum & Mason, and then for the final paragraph ‘doctoring’ a recipe from The Reader’s Digest Cookery Year, altering quantities here and there for copyright purposes. What, you may be thinking, has any of this got to do with your roving correspondent’s contribution to this newsletter? Well if I’m not careful I may take you all on a streams-of-consciousness-type journey as I wax lyrical having just returned from a few days in Burgundy, an area of France which remains very close to my heart having spent a year as a student at Dijon university in the early 80’s. My visit may or may not have been prompted by a quite exclusive Burgundy ‘En Primeur’ tasting of the 2015 vintage that I went along to recently. The two producers showing were Bouchard Père et Fils and William Fèvre and the venue was Brown’s Hotel in Mayfair, and was different again to the St Emilion and Bordeaux tastings I had been along to before. I felt as though it was a more intense occasion than either of the Bordeaux tastings, which might have been due to the dimensions of the room, which was the size of a private dining room. The intensity of the occasion was slightly leavened by the presence of Robin Warren-Adamson, our contact with the distributors, who did his utmost to make me welcome. I have to say that unlike the Bordeaux tastings, neither producer had wines from earlier vintages to compare tastings of the new growth with – so I felt slightly short-changed. This difficulty was particularly evident when tasting the whites, as generally speaking they all lacked, doubtless as a result of their newness, much in character to distinguish one AOC from another. I even had a job to enthuse about the Corton-Charlemagne, from Bouchard, which has always struck me as the ne plus altra of Burgundy whites. It also told me that tasting wines ‘en primeur’ is not an easy thing to do by any means and that you can never learn too much about what to look for when swilling a mouthful of grape around your palate. The reds were generally more interesting – no surprise there then! – a lot of typical, subtly fruity Pinot Noir softness. It is ever a surprise to me that these tiny villages – Volnay, Pommard, Chambolle-Musigny – often one-horse towns, have around them some of the most valuable real-estate in the world, because of the quality of the wines produced in a comparatively small geographical area. 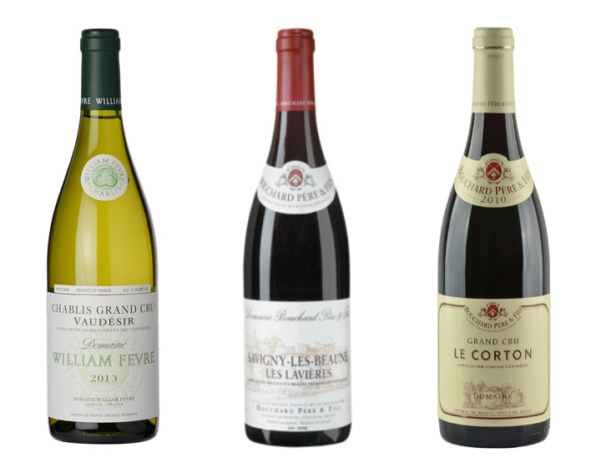 The powers that be have asked me – quite a privilege this – to recommend one white wine and two reds from the 2015 Burgundy tasting, which I am delighted to do for them and for you. Here goes: my white selection is a Chablis Grand Cru Vaudésir from William Fèvre. My two permitted red selections are: Savigny-les-Beaune and Le Corton Grand Cru, both from Bouchard Père et Fils. I was particularly impressed with the Le Corton, not having come across it before. And finally, here is a surprise tip! Wandering around the streets of Beaune on my recent visit I came upon a wine-bar, La Maison de Maurice, where I tasted a very fine St Aubin Le Ban 2009 from Domaine Derain. A magnum would have cost me 65 Euros, so it’s not top-end in price, but it speaks to me of the essence of the ‘terroir’. I have no idea where to find it in this country but we have people working on it as I write. Santé! William Fèvre Chablis Grand Cru Vaudésir – Fresh, refined aromas of flowers and fruit. On the palate, it is distinguished by particular subtlety: a delicious blend of softness and liveliness. Round and airy, it is very charming from its first youth. Bouchard Père et Fils Savigny-les-Beaune – Delicate bouquet with berry fruit notes. On the palate, seductive with the subtle intensity of its aromas and for its tenderness. Good ageing potential. Bouchard Père et Fils Le Corton Grand Cru – Intense bouquet with aromas of red and black fruit, spices and a touch a oak. Rich and structured on the palate, this wine needs a bit of patience in order to reveal its raciness and great distinction. Excellent ageing potential.